Here's what some of our awesome clients have to say about us! I just wanted to send a special thank you to Copy Cats. You made my Son 5th Birthday one for the ages. Santi was amazing. He was polite, knew exactly how to handle the kids, and knew all the answers to their character related questions. He never got frustrated. I didn't even see him sweat!!! LOL... He made my Son's dream come true, spending time with a Super Hero!!! Magic show and tattoo presentation was on point!! How many kids get to play Laser Tag with their favorite hero!! I usually do not do testimonials or reviews but he was so amazing and patient with the kids. I felt like I owed him at the end. I hope this helps someone, as the other Reviews did for us!! Thanks Copy Cats and Santi!!!! Thank you for a wonderful party!! Andrea was fabulous !! My little girl is still talking about her wonderful Birthday party!!! I would recommend your company anytime. The princess made my daughter's bday complete. She was sweet and patient with the kids and she had the best disposition. She made my daughter feel special and even incorporated things that I told her to personalize it for my 5 year old. It was absolutely perfect!! It was worth every penny. Thank you all for sending us Andrea as I requested......she is awesome. Thank you so much for coming to Scottish Rite and Egleston to entertain the children. 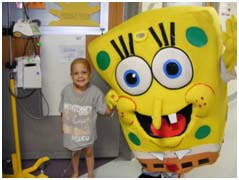 Your visit is always one of the highlights of our hospital camp. You always come in with a smile and the children can feel your energy. You certainly put many a smile of the faces of these special kiddos. Take good care and I will look forward to seeing you again soon. Thank YOU for being the highlight of Gracie's party. She went to bed Saturday night talking about you. With her last ounce of energy before passing out from exhaustion, she talked about you. I think you could tell how much she truly liked you. And it wasn't just the costume - you embodied the spirit of the sweet and funny side of the tickle me monster costume that is so endearing to children. Not just anyone can do what you do. It's a gift that you have. And you brought happiness and joy to Gracie and actually everyone at the party. We will definitely call you again. I doubt we will wait for Gracie's birthday. We might just have you visit Gracie for a special day sometime. Bless you for who you are and what you do. We are so thankful to copy cats for kids for making our twins first birthday party a blast!! The girly clown was great and she did wonderful keeping the kids attention, young and older!. 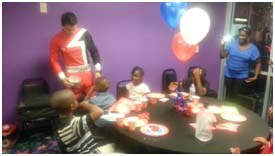 I attended a birthday party this past Saturday, June 9th for "little Lyndsey" in Powder Springs. I have to tell you that I, along with all the kids and adults at the party were very pleased with the glass slipper princess from "CopyCats". I believe her name was Elizabeth. She was truly great with the children, so believable and so sincere and genuine with them. All the adults there actually commented on this to each other, how pleased and impressed they were. "My hats off to "CopyCats", I myself was not familiar with this company. You made a mighty special birthday for Lyndsey, and made a lot of adults happy as well. I will be pleased to refer Copy Cats to folks I know! Thank you so much for such a wonderful experience! The apple princess was amazing and ever thing we dreamed of! She was such a delight to have at our party and we cant wait to invite her back again next year! All the parents and children were raving on and on about how wonderful she was!!! Thank you so much for making my daughter Atlanta’sparty a dream come true!!!!! Hi. I would like to commend the representation from your company for my nephew's first birthday party in Mableton, Georgia. Elmo and the clown were amazing! The clown arrived promptly and put on a full fledged production. The guests as well as the birthday boy were thoroughly entertained with the magic show, face painting, balloons, songs, and dance. This was a 1st birthday that Brandon will always cherish. I just wanted to send a quick email to express HOW HAPPY I was with our princess yesterday. I believe her name was Jaimee and she was just the most wonderful thing ever!!!!! I run a cake/party blog and I am constantly planning parties and even throwing them...and I must say, THIS party was my all time favorite and it was for one reason, our sweet Cinderella princess who visited our house! :) I was actually able to sit down, enjoy the party (instead of running around trying to entertain everyone). The children were amazed by her and it wasn't just her costume they were amazed by! Her VOICE (OMG! ), she was sweet, entertaining, artistic, magic show, balloon animals, making sure every child got some attention on them, etc....it was amazing. I had no idea!!! I can't believe I have gone THIS long without using y'all!!!!! Moms were leaving the house, checking with me to make sure they knew her name! If you get a chance check out my blog. I'll be posting pictures of the party in a couple of weeks. I will be submitting them to Hostess With The Mostess today (in which your company will be mentioned) if it is featured. (along with any other websites it is featured on). I hope y'all express my appreciation to your wonderful princess character. She is the BEST! WOW! Jaymi was absolutely AMAZING as Glass Slipper at my 3 year-old daughter Hadley¹s birthday party. We had a princess dress-up party for 10 girls, and they were all mesmerized by Jaymi the entire time. We have used your services over the years with our other children several times, so we are obviously pleased with the characters. But, Jaymi was above and beyond what we expected. Her voice is incredible as she sang the princess songs while doing tattoos and painting faces. She had them all engaged the entire party with her stories, songs, magic and balloons. She even made it fun for Hadley¹s two big brothers by teasing them and making sword balloons. We just cannot say enough about Jaymi. She truly made our daughter¹s birthday spectacular! She came to my Daughter's 1st Birthday party on Saturday, we had her an Character Princess party & Kevin was the highlight of the party.. My husband & I didn't tell anyone that the tickle me monster was coming so it was a HUGE surprise to everyone including the adults! LOL! Our daughter was SO excited (she LOVES Elmo)! We will use your company again & again because of Kevin & hopefully we can request Kevin each time we do! I just wanted to thank you and Copy Cats for once again agreeing to send your cartoon characters and superheros to our Easter gala for homeless children. We are expecting over 800 kids this year. Copy Cats characters have really become a tradition at our Gala. They really provide excitement for our younger kids who love Explorer Girl, the Glass Slipper Princess, Groovy Dog, and Superheros, and all others. Copy Cats has been doing this so long now I can no longer remember exactly when our relationship began. I know it has been at least six or seven years and maybe more. The fact that these kids volunteer their services really says something positive, and All-American about your team. One of the things that really impresses me is how gracious and friendly your people are. They all give up a good party of an important Holiday to share the day with homeless children. They all seem to really enjoy what they are doing. 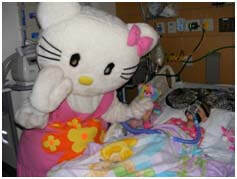 Copy Cats really helps to make this a memorable day for kids who are going through a really trying time in their lives. So best wishes for you and Copy Cats For Kids, and may both live long and prosper. I hope our relationship lasts a good, long time. I just wanted to send a few pictures and let you know how pleased we were with Jessica our Mermaid Princess! She was an incredible face painter and the children were in awe of her balloon-making skills. She was an adorable Mermaid Princess and handled 20+ children with ease. All of the parents at the party wanted to know where I found her! I had never used Copy Cats before but was so pleased with the entire process. I highly recommend your company and Jessica. It was a wonderful party- thanks for your help! !